Bound for London Waterloo, the 2G44 train was about to depart platform 2 at Guildford station. Suddenly, at 2:37 pm, July 7, 2017, an explosion occurred in the train’s underframe equipment case, ejecting debris onto station platforms and into a nearby parking lot. Fortunately, there were no injuries to passengers or staff; damage was contained to the train and station furnishings. It could have been much worse. The cause of the explosion was an accumulation of flammable gases within the traction equipment case underneath one of the train’s coaches. The gases were generated after the failure of a large electrical capacitor inside the equipment case; the capacitor failure was due to a manufacturing defect. Recently retrofitted with a modern version of the traction equipment, the train’s replacement equipment also included the failed capacitor. The project team overseeing the design and installation of the new equipment did not consider the risk of an explosion due to a manufacturer’s defect within the capacitor. As a result, there were no preventative engineering safeguards. 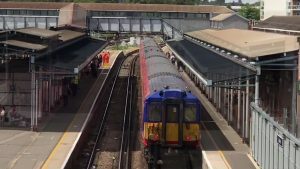 The Rail Accident Investigation Branch (RAIB) has recommended a review of the design of UK trains’ electric traction systems to ensure adequate safeguards are in place to offset any identified anomalies and to prevent similar explosions. Learn about the six learning points recommended by the RAIB for this investigation. Use the TapRooT® System to solve problems. Attend one of our courses. We offer a basic 2-Day Course and an advanced 5-Day Course. You may also contact us about having a course at your site.